Edinburgh: T & T Clark, 1894. . xv + 633 pages. College library stamp to bottom edge, front board loosening, front endpaper missing.. Sixth Edition. Hard Cover. Average Minus. Edinburgh: Edinburgh Printing and Publishing Co, 1840. . xxiv + 627 pages, cloth spine missing, foxed. 7¾ x 4¾ x 1½ inches.. Cloth. Average Minus. Edinburgh: Her Majesty's Stationery Office, 1967. . 148 pages, large format. Scarce.. Hard Cover. Good. Arbroath: J Findlay for T Oliver, 1802. . viii + 234 + 2 pages, paper glued over spine. Fairly small print. Signed: D A Macf(arlane), in pencil.. Hard Cover. Average. Edinburgh: Robert Buchanan, 1831. . 526 pages, piece of cloth glued over spine, foxed. 7¾ x 4¾ x 1½ inches. Signed James Mitchell, Darwhilling; and: D A Macf[arlane].. Hard Cover. Average Minus. 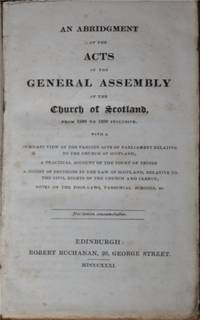 Edinburgh: The Stair Society, 1938. . 335 pages, this is Number 4 of the Stair Society volumes, and contains sections on Courts and Jurisdictions; Actions and Diligence; Process and Evidence; Crimes; plus three appendices and an index. Typical subjects are Of the Shireff; Of Repledging; Of Spuilzie and Wrongous Intromission; Of Manse and Gleeb; Of Divorcement; Of the Oath of Calumnie; Of Robberie and Theft.. Cloth. Good.